Christ the Redeemer is a statue in Rio de Janeiro, Brazil that was built as a symbol of Brazilian Christianity. Christ the Redeemer is an Art Deco statue created by French sculptor Paul Landowski and built by the Brazilian engineer Heitor da Silva Costa, in collaboration with the French engineer Albert Caquot. It’s considered the largest Art Deco statue in the world and the 5th largest statue of Jesus in the world. It is 30.1 metres (99 ft) tall, not including its 6 meters (20 feet) pedestal, and 19 meters (62 feet) wide. It weighs about 635 tonnes (700 short tons) , and is located at the peak of the 700 meters (2,300 feet) Corcovado mountain in the Tijuca Forest National Park overlooking the city. offers spectacular views of Ipanema, the Maracana football stadium and the Serra do Órgãos mountain range. 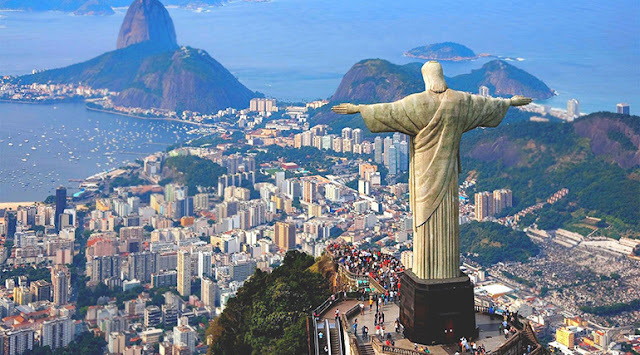 The statue is considered an icon of Rio de Janeiro and Brazil. The idea of erecting a large statue atop Mount Corcovado was first suggested in the mid-1850s, when Vincentian priest Pedro Maria Boss requested financing from Princess Isabel to build a large religious monument. Princess Isabel did not think much of the idea and it was dismissed in 1889, when Brazil became a republic with laws mandating the separation of church and state. The second proposal for a landmark statue on the mountain was made in 1920 by the Catholic Circle of Rio. The group organized an event called Semana do Monumento (“Monument Week”) to attract donations and collect signatures to support the building of the statue. The donations came mostly from Brazilian Catholics. The designs considered for the “Statue of the Christ” included a representation of the Christian cross, a statue of Jesus Christ with a globe in his hands, and a pedestal symbolizing the world. The statue of Christ the Redeemer with open arms, as a symbol of peace, was chosen. Construction began in 1922 and took nine years to complete. It is made of reinforced concrete and soapstone. The stones that were used came from Sweden. The statue had to be constructed in pieces and carried to the mountain top to be erected. The statue was completed in 1931. It officially opened on October 12, 1931. The cost in 1931 was approximately $250,000 . Today that would roughly be the equivalent of $3.2 million. In 1990, restoration work was conducted through an agreement among several organizations. More work on the statue and its environs was conducted in 2003 and early 2010. In 2003, a set of escalators, walkways, and elevators were installed to facilitate access to the platform surrounding the statue. On February 10, 2008 a violent thunderstorm resulted in a lightning strike to the statue. The head, eyebrows and fingers were damaged.A restoration effort was put in place by the Rio de Janeiro state government to replace some of the outer soapstone layers and repair the lightning rods installed on the statue. It was damaged by lightning again, on January 17, 2014, where a finger on the right hand was dislodged. In 2010, a massive restoration of the statue was undertaken. The statue was washed, the mortar and soapstone that cover the statue were replaced, the internal structure of iron was restored, and the monument was made waterproof. The statue was vandalized during renovation, wherein paint was sprayed along the arm. Mayor Eduardo Paes called the act “a crime against the nation”. The culprits later apologized and presented themselves to the police. The statue is lit up every single night and can then be seen from far way. In fact, 300 brand new energy-efficient LED projectors designed by the Plastic Artist Peter Gasper were inaugurated in 2011. It allows for changing colors, intensity, and speed. This statue became one of the New Seven Wonders of the World on July 7th, 2007. Over 1,800,000 people visit the Christ the Redeemer statue in Rio de Janeiro each year. Many local people say that the best time to see this wonder is either evening or at night time as it presents a sparking view of the city.